One has to be lucky to have an opportunity like this. I’ve always liked visiting factories and plants of anything, from soybean oil plants to tractor plants, such as I have visited in school and college days. But to visit a motorcycle factory, well that is special. Now add to it that we are talking here about Ducati and it makes it even more special. Yes, I am lucky. Let’s backtrack a little here. 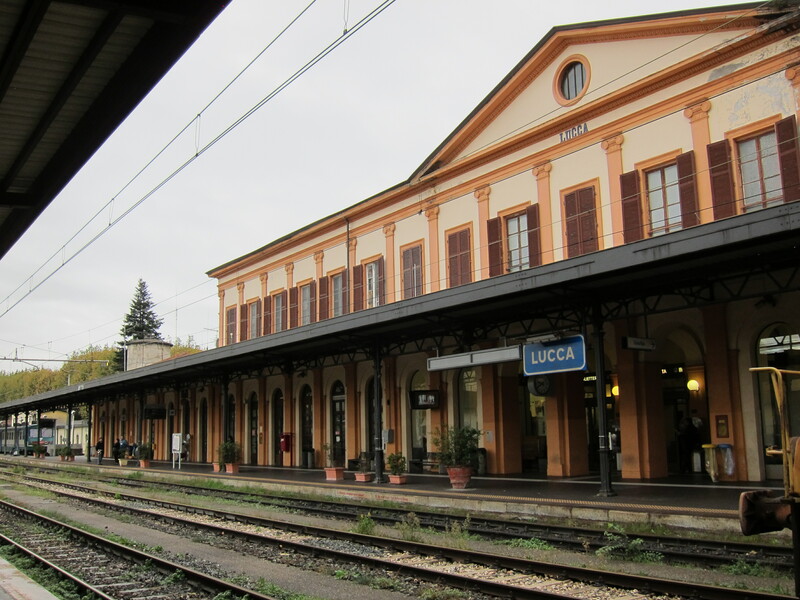 I was visiting my dear friend Flora in Lucca, and it was from there that I took a train to spend an afternoon at the Ducati plant with my friends Doug and Annie, who had rented an apartment in Bologna in October. Just as a side bar, I love the train system in Europe. You are here and you are there, you go everywhere and most of the time, on schedule. I met Doug and Annie at the train station in Bologna, we had a nice lunch accompanied by a bottle of Brunello the Montepulciano at their apartment in Bologna and then we set off to get a public transit bus to Borgo Panigale, where we exited at the Ducati station. The day before I had called Ducati and had made a reservation for the “English” tour. They took my first name (no last names for things like this) making it for a nice and warm informality. We arrived half an hour early at the plant, and we met Donatella (on the left), the factory tour guide, taking the “Italian” group for their tour. The tour consists of a museum and factory tour, a total of one hour. 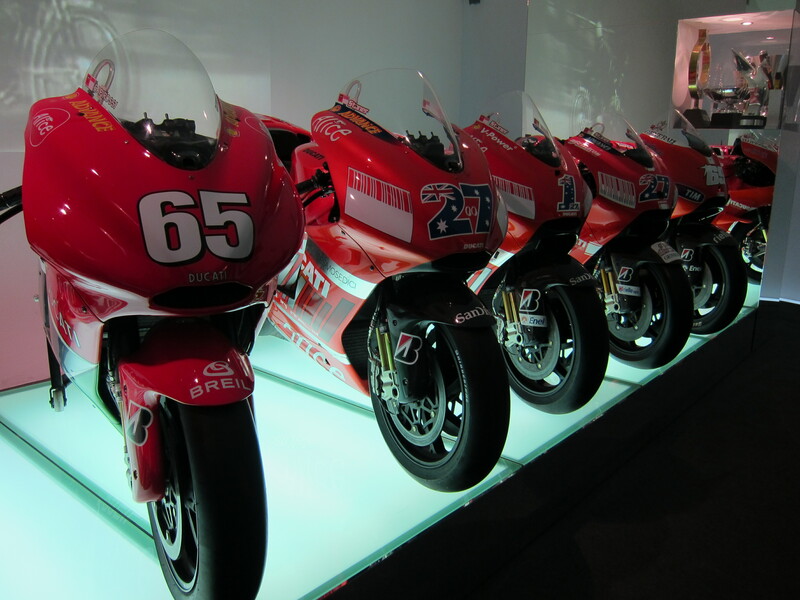 We would start our tour at the Ducati museum. 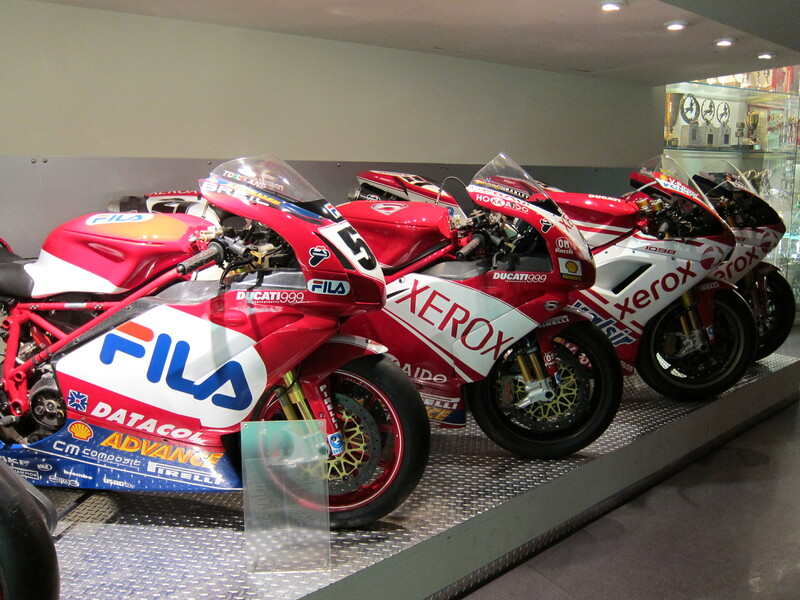 Starting with the museum, a bit of history about Ducati. Although “electronics” is a more modern name for such products, that’s how I can best describe how the Ducati company started: they made radios. This is what you get from Wikipedia: “In 1926, three brothers, Adriano, Marcello and Bruno Ducati, founded Societa Scientifica Radio Brevetti Ducati in Bologna to produce vacuum tubes, condensers and other radio components, becoming successful enough by 1935 to construct a new factory in the Borgo Panigale area of the city. 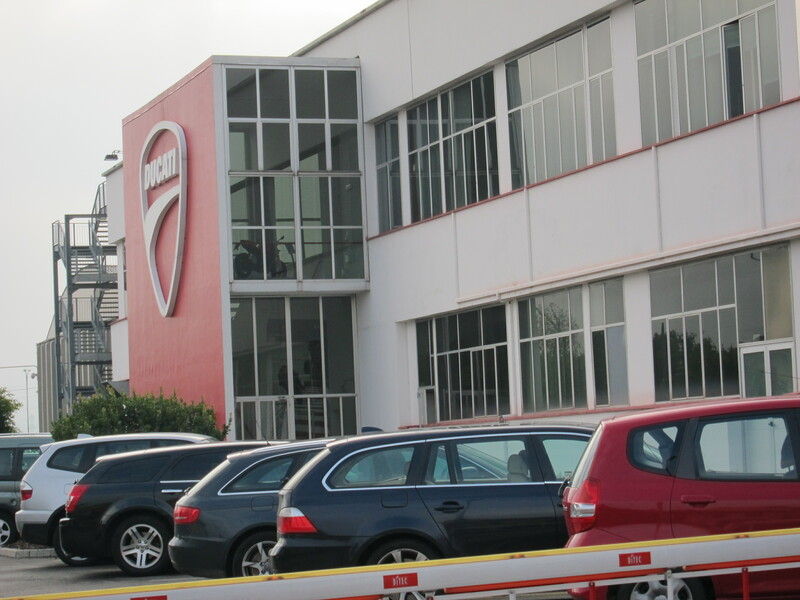 Production was maintained during World War II, despite the Ducati factory being a repeated target for Allied bombing”. After the war, with no transportation available, and expensive gasoline, Ducati started making small motors to be adapted to or installed in bicycles. That was the “Cucciolo” (puppy dog in English) as shown by our first Museum guide, Maria. Ducati sold thousands of these little motors. This motor was not developed by Ducati, but Ducati produced a cucciolo based motorcycle, in 1950. And the rest is history. Or the rest of the history. Or the important part of the history as that was the basis, the foundation for what we now know as Ducati. 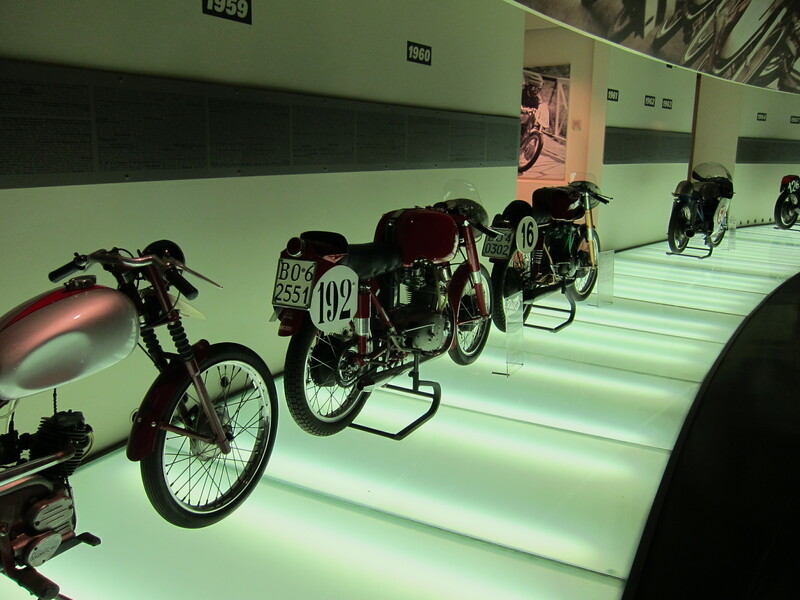 The museum shows motorcycles from all eras of Ducati. You can see an Elephant from the time Cagiva owned Ducati in the 80’s and 90’s. 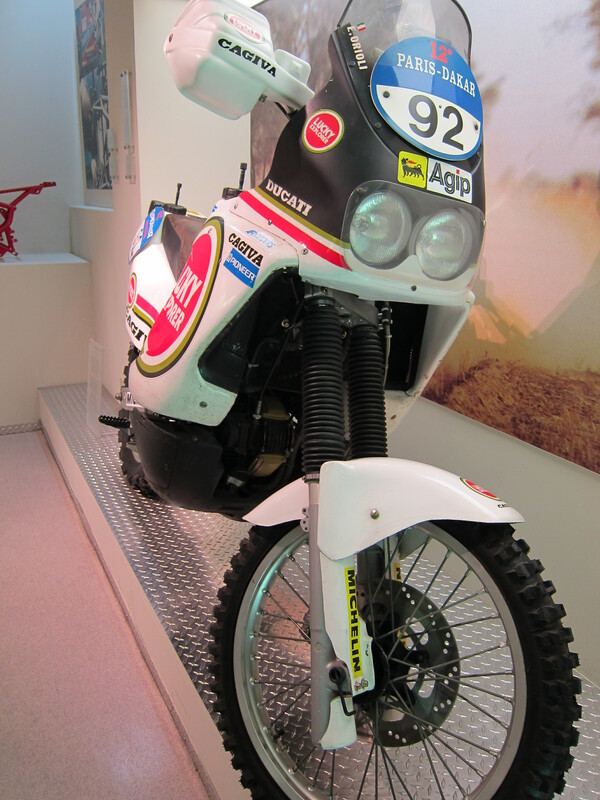 1989-90 Cagiva Marathon. Winner Paris Dakar, 1990. Another interesting enduro bike is Paolo Pirozzi’s Lidia. This 2010 Multistrada (above) was taken around the world in 2010. He was sponsored by the Desmo Owners Clubs around the world. He came by Eugene in end of October, 2010. I was on a work trip out of town, so I missed the action. This trip was part of the several initial promotions by Ducati when this excellent bike was first launched. The Desmo Owners club gives me an opportunity to talk about the desmo word. It is short for desmodromic. It is a valve management system invented by Ducatu engineers and is without a doubt synonimous with Ducati. 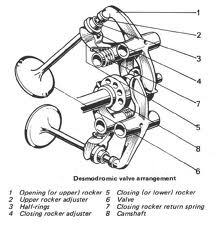 Below is an animation of the desmodromic valve management system. The museum includes a showcase of the desmodromic system. 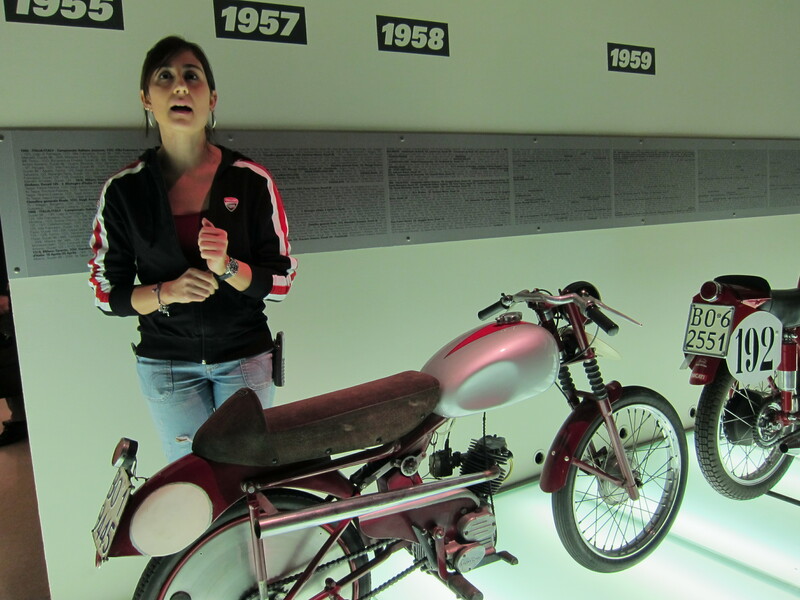 Continuing the tour, Ilaria showed us the various motorcycles from the early 50’s and on. And the more recent bikes. Unfortunately we were not allowed to take pictures during the factory tour. My impressions as we walked around the many work stations and assembly lines are that they are organized, but definitely not fanatic about organization. They are organized Italian style. It definitely does not show a teutonic organization or a Japanese efficiency. I actually like it. Most of the components arrive pre-assembled. Engines are assembled in the plant, and cam shafts are machined on site. Frames come from subsidiaries in Italy. Other specialized components such as brakes and other electronic systems also arrive from external suppliers. And that is the case for all vehicle manufacturers these days. Final assembly, mostly plastics, are added outside of this location, on some transition area where bikes are organized for final shipment. As you walk past people on their stations, they are very friendly and you walk away with a feeling that they are proud of their bikes, their work. No robots onsite, Donatella proudly said. In Approximate numbers, they have 500 people on the floor, 300 on the administration, marketing and R&D, and 150 on the GP bikes. And they know each other, like a family. The evening before the trip to Bologna I had a glass of wine with my friend Vitorio in Lucca and when I told him I was going to visit the Ducati plant he mentioned the name of an old friend of his that works there, friends from the time Vittorio went to elementary school. 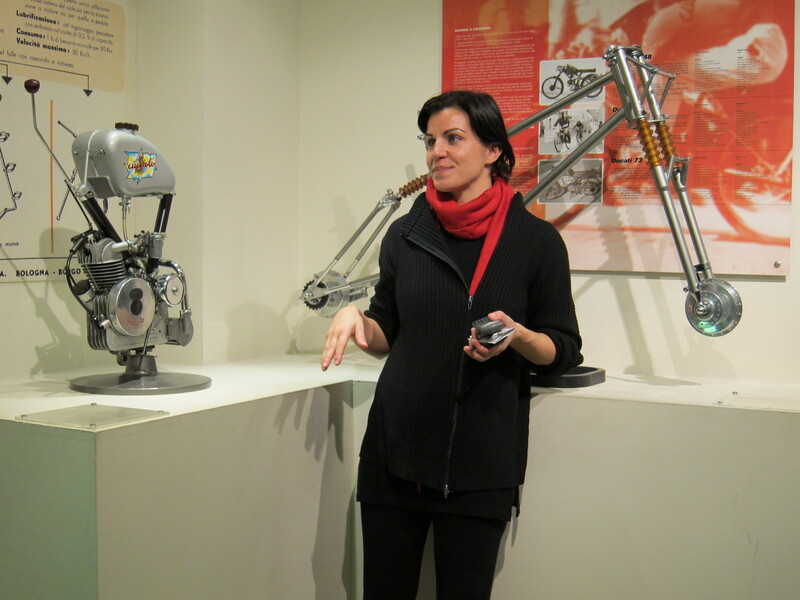 During the tour I had a chance to meet Vitorio’s friend. Donatella, the factory tour, kept telling me we would walk by his station and she would let me know who he was. In the end, he was not there. So at the front gate, before leaving I made a final try, checked with the front guards. They took me in their office, checked the directory, got his Ducati mobile number (they all have an individual mobile, plant number), the guard “dialed” it for me and gave me the phone. Not five minutes later and Franco was out by the gate and we were talking. Next time I will spend more time in Borgo Panigale to know more about this operation. Maybe next time I will be riding a Ducati. And yes, we arrived there too early to see their newest bike, three weeks more precisely, so we missed the 1199 Panigale, Ducati’s new superbike. It will be on display at the EICMA show. After the EICMA official release of this bike, I’ve heard, visitors will have a chance to see it being assembled in one of their lines during a factory tour. EDIT: The 1199 Panigale was voted the most beautiful bike at the EICMA 2011 show. 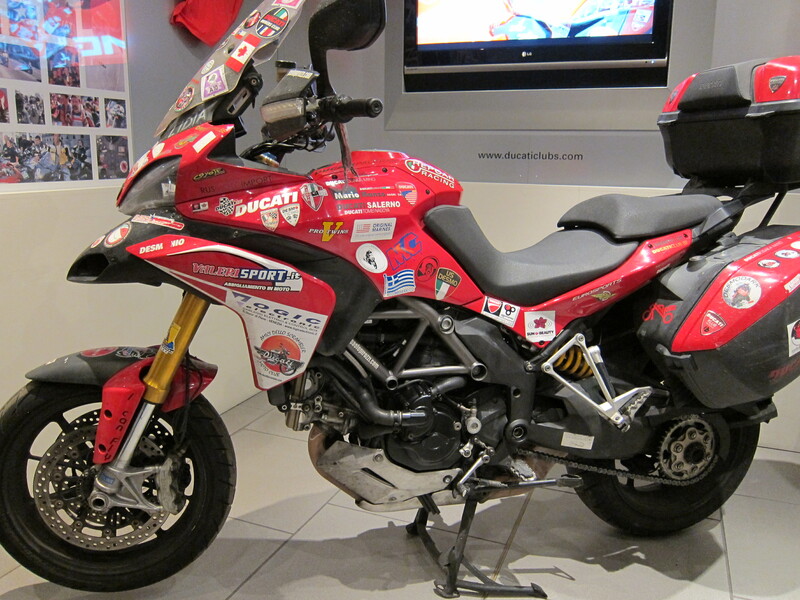 This entry was posted in Bike Reviews, Travel and tagged Ducati, Italy, motorcycles, riding. Bookmark the permalink.